Shares of Canadian metal companies got sideswiped Thursday after the Trump administration announced it will impose tariffs of 25 per cent on imported steel and 10 per cent on imported aluminum from Canada, beginning at midnight. In trading on the Toronto Stock Exchange, shares of Stelco Holding Inc. fell 3.5 per cent to close at $24. Steel distributor and processor Russel Metals dropped about 0.9 per cent to $29.31. 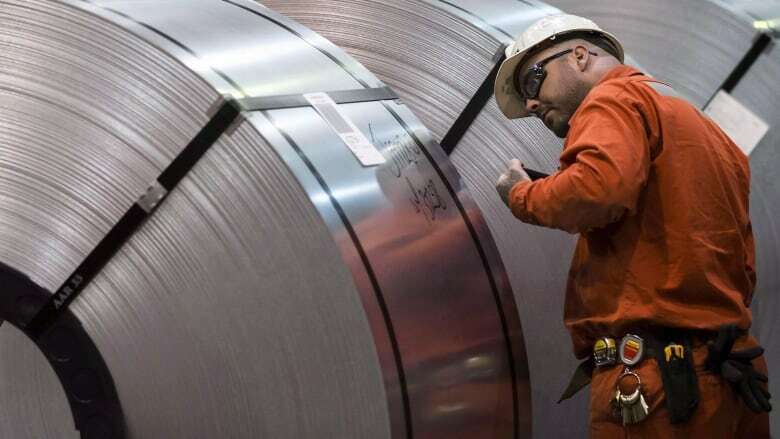 While shares of Canadian steel firms headed lower, their U.S. counterparts got an initial boost before giving back some of their initial gains. U.S. Steel finished up 1.7 per cent at $36.87 US on the NYSE, while Nucor finished up by only 0.1 per cent at $64.19 US. Aluminum producer Alcoa jumped on the news but then fell into negative territory. The stock was down by almost one per cent at $48.07 US amid reports the company could be impacted by the tariff. Bloomberg reported that about one-third of Alcoa's smelting capacity is based in Canada. Some stocks of U.S. companies that could be adversely affected by the tariffs, or by possible retaliatory action against the U.S., headed down. Soup maker Campbell was off by 2.6 per cent at $33.64 US, for example. motorcycles and bourbon if the U.S. goes ahead with the proposal. The head of the Canadian Chamber of Commerce called on Canada to retaliate against the U.S. move. "We need to act vigorously to support our domestic industries, and to send a message to the U.S. administration that their unilateral protectionist measures will not come without a serious cost to themselves," Perrin Beatty, the chamber's president and CEO, said in a written statement. When the U.S. initially announced back in March that it would impose tariffs on imports of steel and aluminum, Canada, Mexico and the EU were granted exemptions. The U.S. said the exemptions granted Canada and Mexico were linked to the ongoing NAFTA negotiations. However, those exemptions expire on Friday. Speaking Thursday, U.S Commerce Secretary Wilbur Ross said: "As to Canada, Mexico, you will recall that the reason for the deferral had been pending the outcome of the NAFTA talks." "Those talks are taking longer than we had hoped. There is no longer a very precise date when they may be concluded and therefore they were added into the list of those who will bear tariffs." Ross said retaliatory measures by Canada and Mexico won't affect the NAFTA talks. "If any of these parties does retaliate, that does not mean that there cannot be continuing negotiations," he said. "They're not mutually exclusive behaviours."